Super-thin, flexible electronics are here. Portuguese startup Ynvisible wants to make sure they make the jump from the lab to tinkerers’ hands as soon as possible, starting today with a series of paper-thin, Arduino compatible modules launched on Kickstarter. The module kits are known as Printoo, and they range from solar cells the size of a credit card to stamp-sized motor drivers. There are LEDs, batteries less than 1 millimeter thick and bluetooth chips so you can control it all from your mobile device. 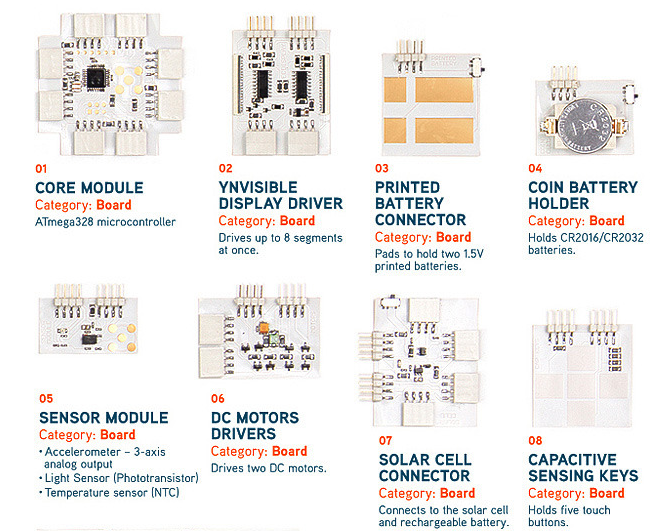 A selection of available modules. Photo courtesy of Ynvisible. Most of the modules sit on a paper-like sheet covered in printed circuits. Printed circuits are being considered for everything from shipping labels to tiny spacecraft NASA might send to Mars, but seeing them made available to the average person is unusual. They can also be joined up with circuits made with a home circuit printer or pen. Ynvisible expects Printoo to find a home among 3D printer owners and DIYers already familiar with Arduino. The modules are small enough to slip into a 3D printed object, opening up ways to easily create robots and other moving or connected devices. They could also be worn as a bracelet or sewn into clothes. Some Printoo kits include a paper-thin display that can show numbers. It could be used to create a basic counter. Photo courtesy of Ynvisible. Printoo is among a gaggle of crowdfunding campaigns to pop up this year seeking to bring connected devices to the average creative person. It’s exciting to see it start moving the options toward the ultra-thin, which will allow users to integrate it into many more applications. Kits range from $45 to $550 and are scheduled to ship in October. Ynvisible will use the funds from the Kickstarter campaign to improve the strength of the connectors that join the modules. 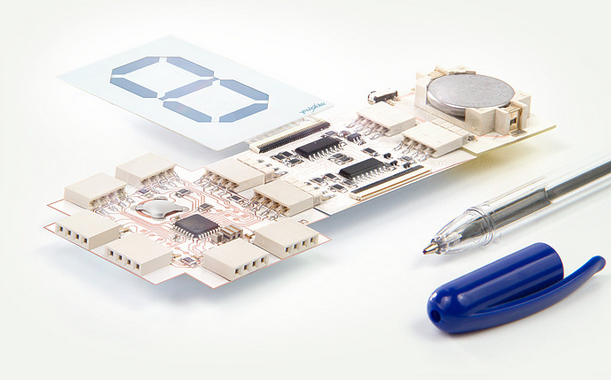 The Printoo modules are on a flexible material covered in printed circuits. Photo courtesy of Ynvisible.